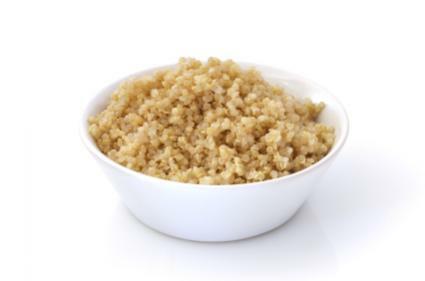 Quinoa is a healthy gluten-free alternative! The pros and cons to the gluten-free, casein-free diet depend entirely on how well this diet is executed. As with all restrictive diets, the medical community will muster concern regarding possible nutrient deficiencies, but the truth of what constitutes a truly healthy diet is still a subject of controversy amongst nutritional experts. The GFCF diet is no different in its potential to cause and exacerbate deficiencies, but when exercised with care and consciousness such a diet can aid certain types of healing while providing adequate nourishment to the dieter. Though the FDA's food pyramid has changed over time, experts agree there are certain fundamental nutrients that form the essentials of a healthy diet. Vitamins, minerals, good fats and proteins alongside antioxidants and enzymes are important dietary factors. Some of these elements are formed within the body as a byproduct of foods, but most need to be obtained through an individual's diet, which is why the term "balanced diet" is so often touted by the medical community. Theoretically, a balanced diet will include a wide variety of foods which contain their own spectrum of nutrients, thus making it easier for a person to derive everything he needs from his food. The pros and cons to the gluten-free, casein-free diet relate largely to the above theory. The cons are easy for nutritionists to spot. Dairy is an abundant source of minerals such as calcium and magnesium. Individuals who choose to forgo dairy products for non-medically vital reasons need to supplement their diet with equally effective sources of these nutrients. Many plants, such as many green vegetables, contain minerals like calcium. However, many dairy-free dieters attempting to obtain calcium solely from green vegetables may suffer a drop in their mineral levels simply due to the fact it is difficult to consume enough of these vegetables. An individual will have to eat an immense amount of kale to equal the bioavailable calcium in a glass of milk. This can become an uncomfortable feat due to the fibrous quality of vegetables. Some persons get around the calcium gram-for-gram issue by juicing their green vegetable so they can ingest large amounts of plant foods without compromising their digestive space with fiber. The Vegetarian Journal provides an excellent online resource for individuals looking to obtain calcium from non-dairy sources. The nutritional elements within most grains can be found easily in other plant foods, but the real issue regarding gluten-elimination diets remains how an individual will compensate for the lack of insoluble fiber. Grains such as wheat are often called "nature's broom" due to their high content of insoluble fiber. This type of fiber serves to sweep the digestive tract, resulting in bowel regularity and a general cleansing of the intestines. Fortunately, there is a wide variety of plant foods that also contain insoluble fiber, including items like rice, quinoa, apples, oranges, and nuts. Provided the individual undertaking such a diet doesn't also host a mass of other food allergies, making up for minerals and fiber shouldn't be too daunting. Restrictive diets are almost always subject to scrutiny, but the sad truth within the nutritional world is that almost all modern diets are deficient in one or more areas. The standard American diet relies heavily on commercially processed foods stripped of nearly all their natural elements and are altered in numerous ways. Produce is often genetically modified and meat products have been known to contain a variety of chemical additives and antibiotics, many of which are downright harmful. One should always be skeptical of packaged foods that boast a horde of supplemental vitamins added after processing to compensate for the nutritional-stripping its ingredients have endured. Hence, when you are starting a new diet and any concern is expressed regarding nutritional limitations, it is important to feel confident regarding your choices. Educating yourself as to the chemical composition of your foods is the first step in achieving a well-balanced and nutritionally sound lifestyle. A gluten-free casein-free diet doesn't need to be any less healthy than a more "normal" diet, but it does have potential to be considerably healthier provided a wide variety of natural and unprocessed foods are ingested by the dieter.